The Christmas season kicked off with a special sparkle Saturday when the Chamber of Commerce hosted Darien Holiday Magic. Several hundred people visited the square by the Grove Street parking lot to ride some wild toy animals, taste hot chocolate and treats, and visit with a rather large man in a white beard wearing a red suit. "I think it's so cute," Missy Knightley of Darien said. "We came last year and it was awesome." "I think it's great," Zeb Clarke of Darien added. "Darien does a lot of wonderful things for the kids and makes it a great place to raise children, especially around the holidays, when they do activities like this." "It's our fourth year and we've tried to involve a lot of different parts of the community in the event," said Carol Wilder-Tamme, chamber president. Along with the generous donations of time and supplies from local businesses, singers from both Darien High School and the Darien Arts Center shared their talent. There was even a Grinch prancing through the crowd, thanks to the talent of Theater 308 member Sofie Sheldon, 15, whose friend Avery Brook, 14, created her extravagant make-up. "It is a lot of fun," Kaye Leong, chamber vice president, said. "This is my favorite part of Christmas, to see the rides here." The rides included gigantic mechanical animals that moved along on wheels -- a polar bear, moose and reindeer. The children took rides around the lot, walked by the caretakers from Safari Rides. "We have become very popular for Christmas tree lightings," Safari Bob said. "At this time of year, we see far less grumbling between parents and children, and it makes for a much nicer environment for us to work in." Bill Jensen, owner of the Darien Toy Box and instrumental organizer for the event, was having as much fun as the kids. "Look at the faces of the kids," he said. "That says it all. It's just a lot of fun." "It's fun to see the kids and give something back to the community," he said. "And I love seeing everyone." 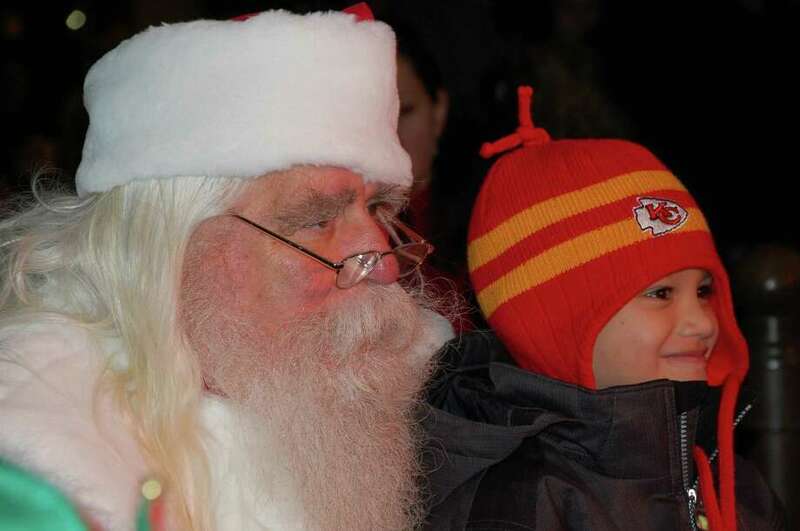 During a reading of "The Night Before Christmas," the big man himself came out of a chimney arranged in the little courtyard next to the lot, which was alive with song and snacks provided by the Girls Scouts. Santa took time to hear from some in a long line of kids who wanted to offer their gift suggestions, while parents grabbed some photos of the event. "The Darien Chamber of Commerce has been working on this a long time," Julia Ambrosi, its secretary, said.